« Bike to Work Day: Drop by our Energizer Station in Pioneer Square! 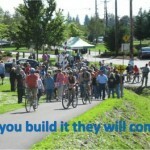 The League of American Bicyclists (LAB) announced its 2012 round of new and renewing Bicycle Friendly Communities and the Washington communities of Tacoma and Snohomish joined the ranks at the bronze level. Port Townsend improved its ranking from bronze to silver and Vancouver retained its bronze status. Washington is currently ranked as the most Bicycle Friendly State by LAB’s Bicycle Friendly America program. 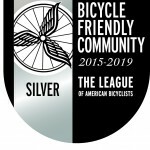 Ten of our communities are now ranked as Bicycle Friendly Communities with Seattle holding the only gold award. Seventeen state businesses have earned a Bicycle Friendly Business designation and the University of Washington holds a silver ranking as a Bicycle Friendly University. 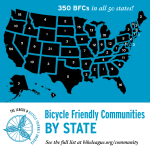 The Bicycle Friendly America program provides incentives, hands-on assistance, and award recognition for communities, universities and businesses that actively support bicycling, and ranks states annually based on their level of bike-friendliness. Learn more about it here. This article was posted in Encouragement, Everett, Tacoma. Bookmark the permalink. Follow comments with the RSS feed for this post. Both comments and trackbacks are closed.